Jimbo provides a GREAT 1 hour program for the children, this party was especially designed for children 1 to 4 years old but works well for any age group. 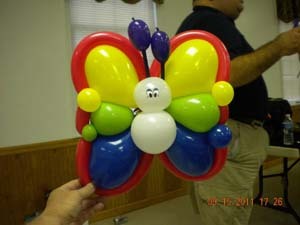 Jimbo entertains by doing Juggling, Magic Tricks, creating Balloon Sculptures and simple game or two. 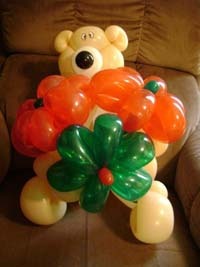 Jimbo will present the birthday child one of three “Special Balloons”. Your choice of either the “Lootle*”, a colorful Butterfly or a huge Teddy Bear, all pictured below. Each child will then be made a Balloon Hat by Jimbo. Have your cameras ready as he will gather the children for a “Kodak Moment”. Jimbo will then pose with the group as pictures are taken. The Birthday Child is presented a personalized Jimbo the Clown Painters Cap as a gift & each guest receives a sticker to wear home. The REGULAR Party plan with Jimbo includes everything from the Short Party but adds an expanded Clown Magic show & your choice of an Jimbo Activity. For the Activity, You may choose from having the children make their own Spin-Art pictures on Jimbo’s special Spin-Art box or they can fill Sand-Art Bottle Necklaces. The Birthday Child still receives his very special balloon figure (see Short Party description). Jimbo still makes a Balloon Hat for each child, then will gather the children for a “Kodak Moment”, so have your cameras ready! Jimbo will pose with the group as pictures are taken. The Birthday Child is given the personalized Jimbo the Clown Painters Cap as a gift. 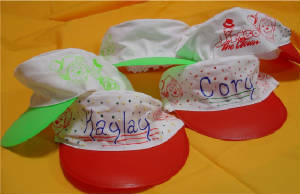 As a bonus with the Regular party, Each child present also receives a gift to take home, your choice of a Jimbo the Clown Hat or Goody Bag plus a sticker to wear home. Introducing the “JIMBO LITE” Party. The Jimbo Lite party is a short 30 minute visit by Jimbo, but still has the essence of the other Jimbo parties. Jimbo arrives and presents the special Balloon Sculpture(see special balloon choices above) and Birthday Hat for the Birthday child. He then makes a balloon hat for all the other children at the party. Once the hats are done, Jimbo will gather the children for a “Kodak moment” Jimbo will pose with the group as pictures are taken. Jimbo will give each child a Sticker before he leaves. The “Jimbo Lite” party has limited availability – it is only available on dates where Jimbo has at least one other engagement that day. Additional charge of $2.00/child for more then 15 guest applies. Normal travel charges apply. 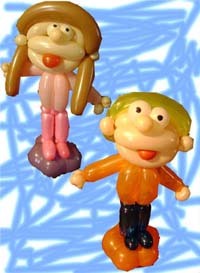 Balloon “Lootles” are little balloon people that look something like the birthday child, matching hair, skin and the child’s favorite colors. “Lootles” stand about 18-20″ tall and each is custom made for the Birthday Child, come standard with the Regular & Short Parties. The “Lootle” is just one of three Special Balloon figures you may pick from, Pictures of the Teddy Bear and the Butterfly are on the “Jimbo’s Latest News” Page. Goody Bags are just one option with the Regular Party, the other option is Jimbo the Clown Painters Caps. 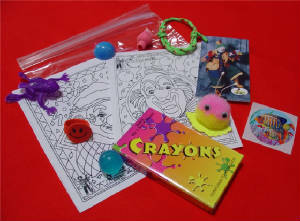 Spin-Art is one of three activities available with the Regular Party Plan, you can also choose Sand-Art Necklaces. 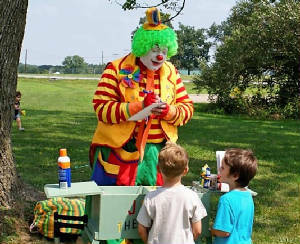 Jimbo the clown provides some of the best children’s party entertainment in Harrisburg, PA. For children under 10 years old, Jimbo offers plenty of fun activities, from juggling and magic to balloon sculptures and crafts.